The nearest airport to Bansko is Sofia, 150km northwest, although some charter companies use Plovdiv, 160km to the east. Transfer time from Sofia is about two and a half hours in normal conditions, and from Plovdiv is four hours – If relying on a transfer company to drive you back to Sofia airport you should allow 5 hours from leaving Bansko until your flight takes off. Travelling from Sofia to Bansko by bus takes about three hours. Buses depart from either Sofia’s Central Bus Station (Tsentralna avtogara), near to the train station on bul. Knyaginya Maria Luiza, or from Ovcha Kupel bus station, 5km southwest of the city centre (on the route of trams no.5 and no.19). Bansko lies two-and-a-half hours’ drive from Sofia. The quickest route is to take the main E79 south to Simitli, from where a well-marked east-bound turn leads over the Predela Pass to Bansko. The Simitli-Bansko road is now first class and offers a smooth ride. In the season be careful where you park your car as the local patrols are about and will lift your car and pound it until you pay for its release. If you would prefer others to do the driving for you, there are many transfer companies that will happily collect you from the airport and return you after your stay in Bansko. Check their prices as they do vary a little, however the quality also varies quite a bit, stick to recommended companies. There are many good ones. Few people ever take the train to Bansko. The journey from Sofia takes over 7 hours and involves a change of trains at the middle-of-nowhere junction of Septemvri. 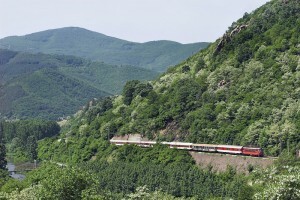 However the trip from Septemvri to Bansko is one of the most scenic that Bulgaria has to offer, with a narrow-gauge track, snaking its way across the western spurs of the Rhodope Mountains. It’s an especially magical journey in winter, with the fir trees covered in frost, and snow-white minarets spearing skywards from the Bulgarian-Muslim villages, sprinkled along the route. Bansko’s train station is near the bus station, an easy 10-minute walk north of the town centre. If you need a taxi and there are none in the forecourt, head for the bus station (turn right outside the train station then bear left) to find one. The train station has a ticket hall but no other facilities. There are reports locally that the narrow guage railway may close, so please check that it is running before making your travel arrangements.